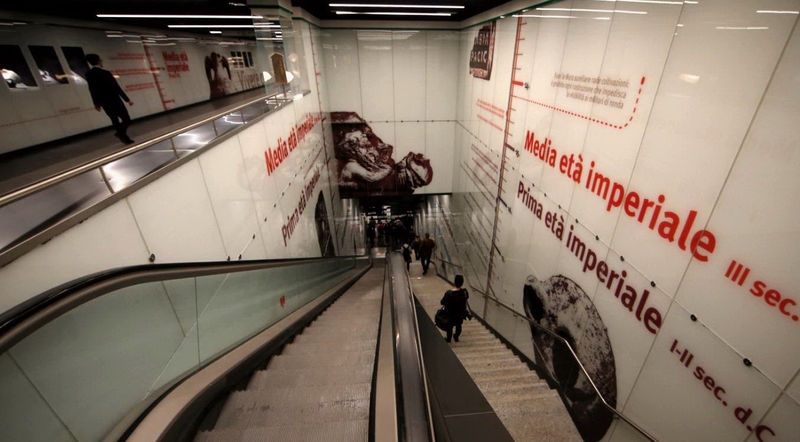 After six years of delays caused by constant archaeological discoveries, the first station of Rome’s new Metro C line is complete. 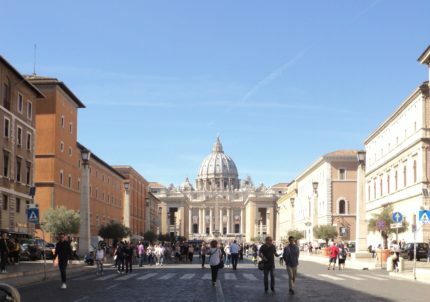 The San Giovanni station near the Papal Archbasilica of St John in Lateran was unveiled to the press this week. The subway stop won’t be open to the public until the end of the year at the earliest because the rest of the line is still under construction. The station’s atrium museum was opened to the public on April 1st of this year, but that was just for the one day. 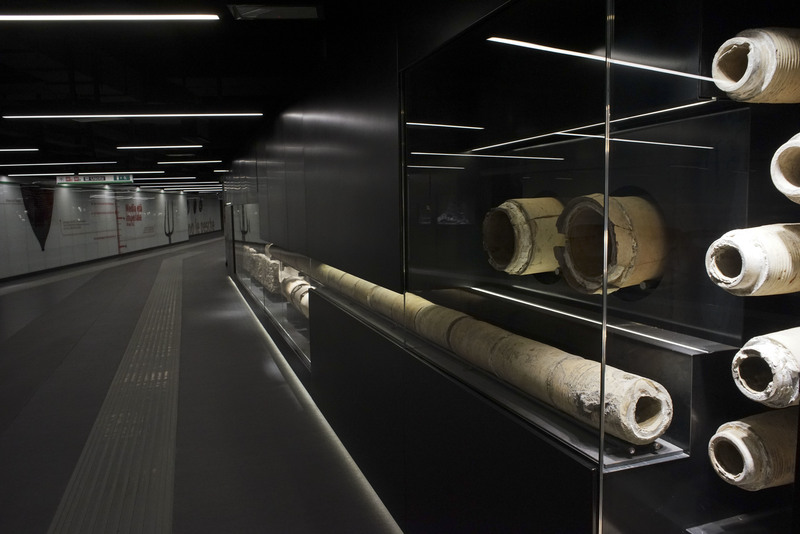 It’s not clear whether visitors will be able to enjoy the exhibits before the official opening of the San Giovanni subway station. 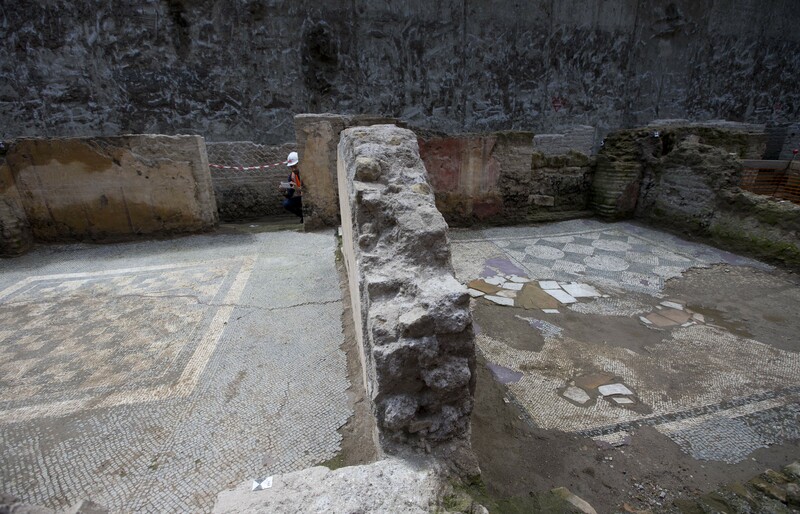 The construction of the San Giovanni station beginning in 2011 unearthed a vast swath of the city’s history, from prehistory to the modern era. The richest finds date to the late Republic and early Imperial era, with the most extraordinary features discovered on a 1st-3rd century A.D. commercial agricultural concern 20 meters (65 feet) below the surface, the closest ever found to the center of the ancient city. 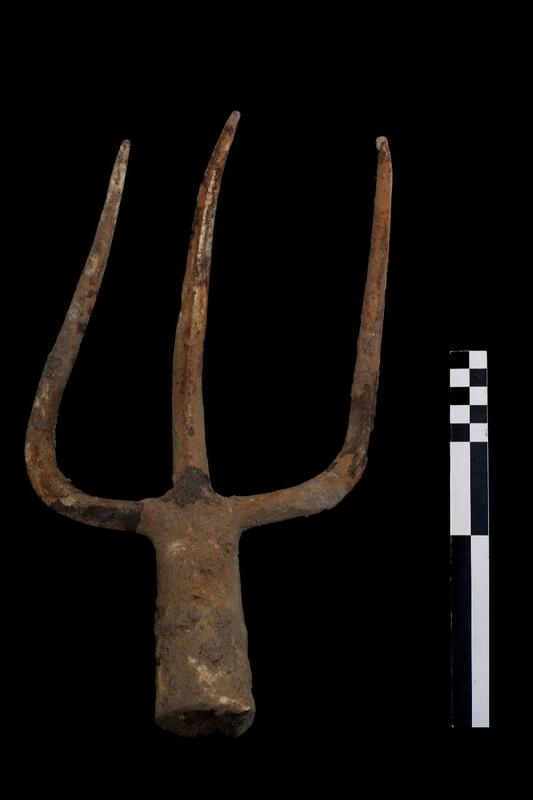 Archaeologists discovered farming-related artifacts including a three-pronged iron pitchfork, woven baskets, and leather fragments, possibly from a shoe or glove. The farm’s engineering was evidenced in grooves carved deep into stone from the many turns of a long-decayed waterwheel, and in recycled amphorae, their ends cut open to be nested into each other in long lines for use as water channels. Archaeologists also found a huge hydraulic reservoir (115 feet by 230 feet), the largest ancient Roman water basin ever found, dating to the 3rd century A.D.
“It seems likely that its main function was to be a water reservoir for crops and an area that made it possible to cope with overflows from the nearby river. No other basin from ancient Roman agriculture is of comparable size. 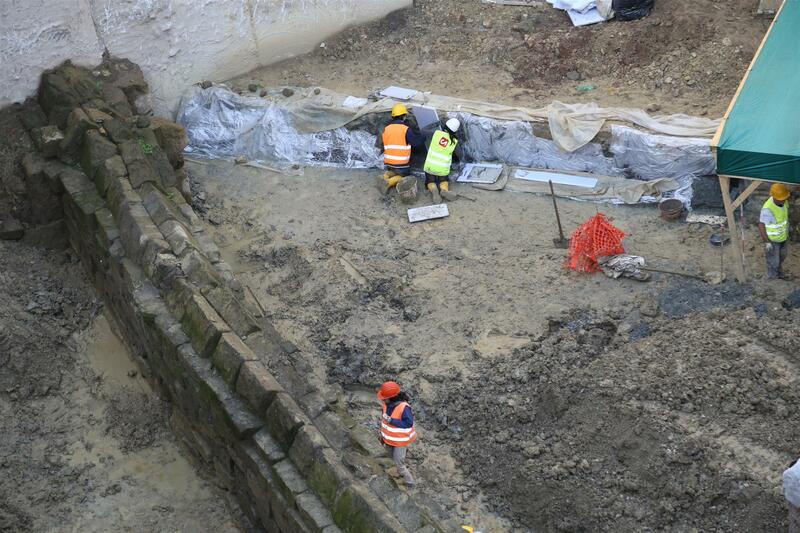 Beyond the walls of the work site it extends toward the (ancient city) wall, where it is probably preserved”. San Giovanni’s massive archaeological endowment didn’t stop there. 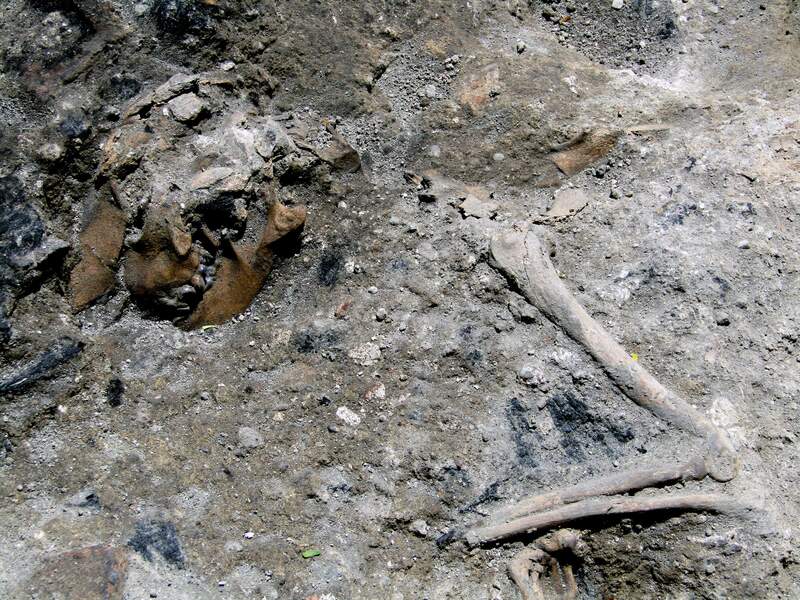 A surprising number of well-preserved archaeobotanical remains were recovered, among them seeds, nuts, and the roots and stumps of willows and other trees. 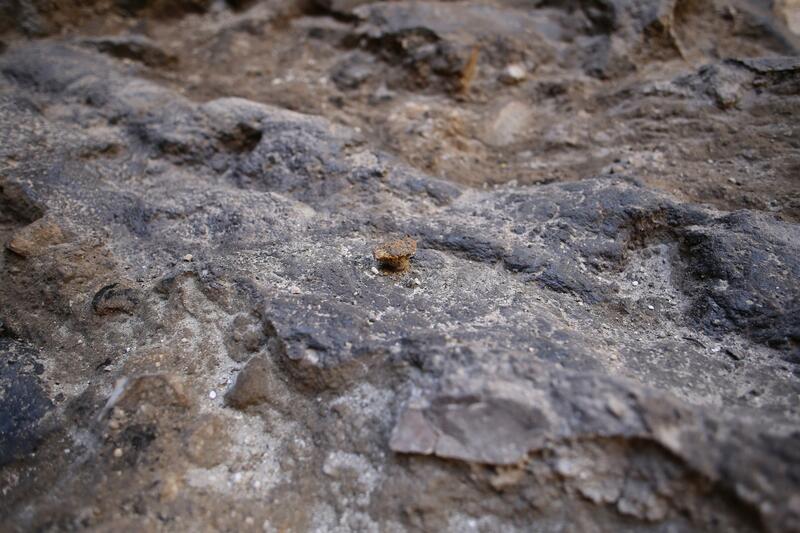 A number of peach pits were also discovered, likely the remnants of the farm’s orchards. Peaches are not native Roman fruits — these probably originated in Persia — and even in the Imperial era they were still considered an expensive, exotic import. It indicates that the farm was used to produce luxury foods, likely for the Imperial table. 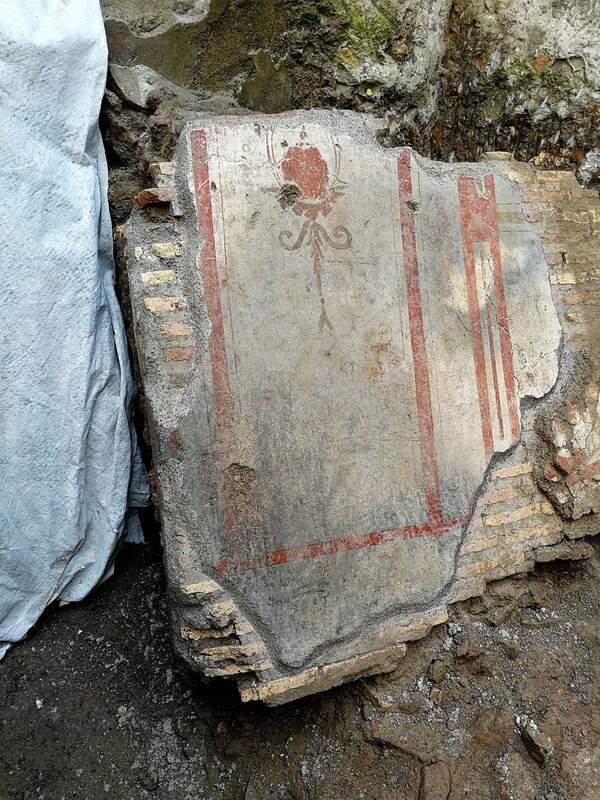 And that’s just scratching the surface of what was found during the San Giovanni dig. 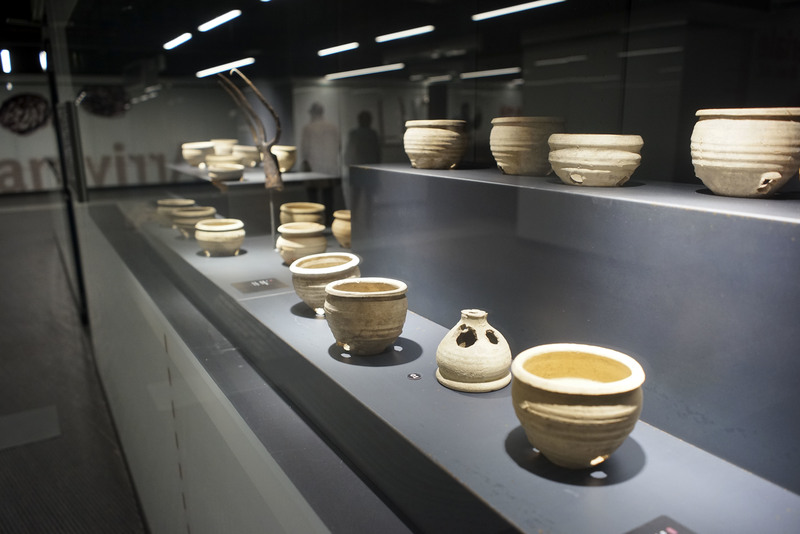 More than 40,000 artifacts were unearthed (hence the half a decade of delays): ancient pottery, coins, oil lamps, delicate glass perfume bottles, baked clay pipes, lead pipes, architectural elements, sculptures, reliefs, colorful dishware from the 17th through 19th centuries and on and on. 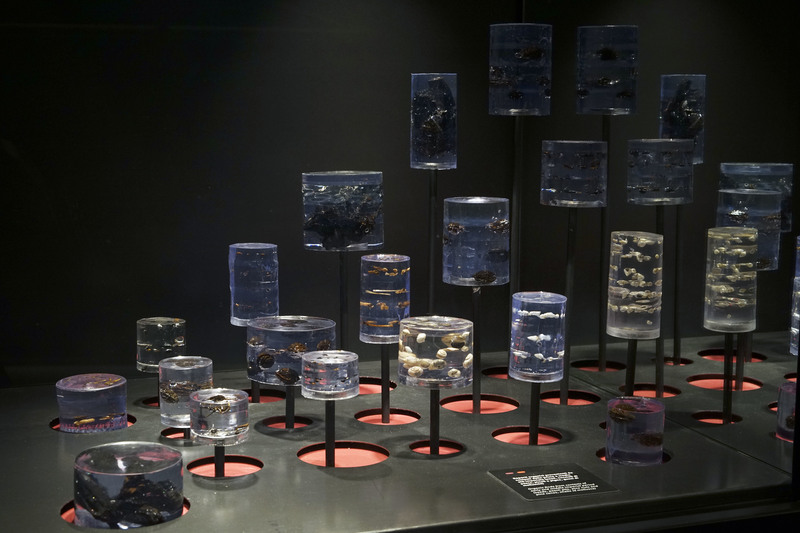 The station museum displays a broad selection of these treasures in spacious, well-lit display cases. The station has been ingeniously designed to take advantage of its subterranean location to create an immersive time machine experience for travelers and visitors. Riders enter the station today, then as they descend towards the train platforms, they pass through the Middle Ages to the Rome of the Emperors to the Republic all the way back to the Pleistocene. Artifact exhibits and information panels accompany you as you time travel, marking important dates in the city’s history. 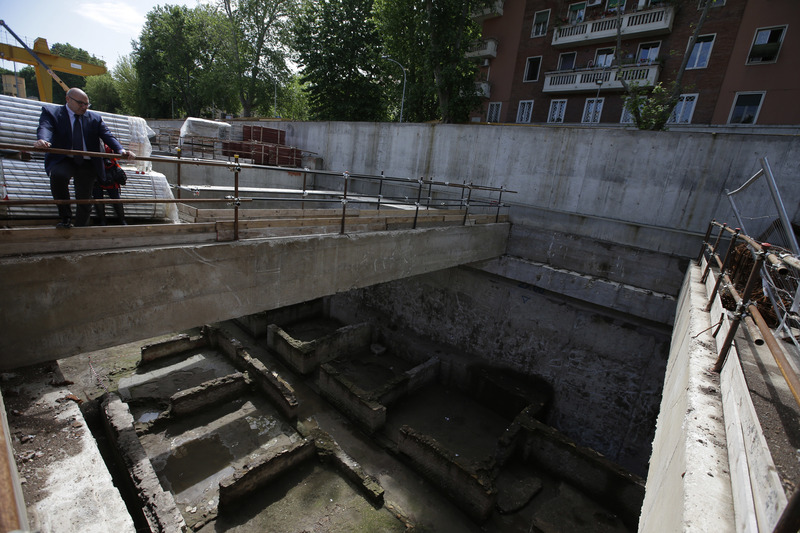 The construction of Rome’s new metro line has encountered yet another archaeological marvel: a Republican-era aqueduct dating to around the 3rd century B.C., likely a section of the first aqueduct built in Rome. 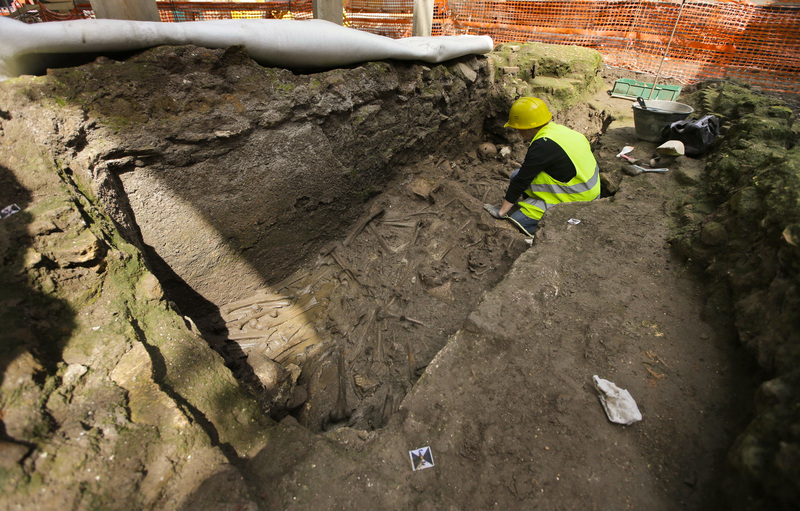 Archaeologists found the structure during construction of a ventilation shaft under Piazza Celimontana on the Celian hill. The shaft’s 18-meter (60-foot) depth allowed them unique access to the 3rd century layers of the city. 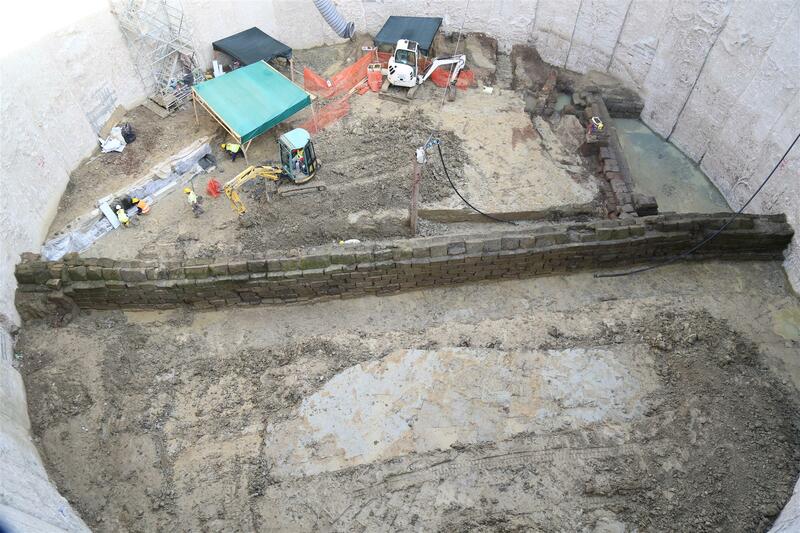 Without the bulkheads keeping the water from flooding the site, it wouldn’t have possible to excavate anywhere near that deep. “The opportunity to safely reach this depth allowed us to uncover and document an exception sequence of stratigraphy and structures from the Iron Age (tombs and grave objects from the tenth century BC) to the modern age (foundations of 19th-century housing,” [sic] [said lead archaeologist Simona Morretta]. What’s more, close examination of the earth revealed the remains of food leftovers, offering an insight into what Romans used to eat, and the animals they kept as pets – from wild boars to swans, pheasants, and large seawater fish. The dating of the aqueduct, determined by the stratigraphy, and its location under the Celian hill point to it being part of the Aqua Appia, the first aqueduct in Rome, built by censors Gaius Plautius Venox and Appius Claudius Caecus in 312 B.C. The source was about 10 miles outside the city, and unlike later aqueducts, almost the entirety of the length of the Aqua Appia was underground. Outside the city it ran through tunnels carved into tufa hills; inside it ran on top of the Servian Wall for stretch, but was mostly carried through channels deep under the city. 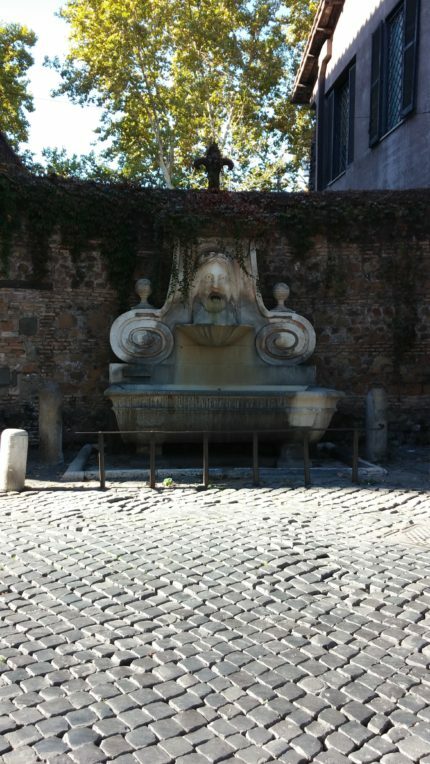 Only three sections of the Aqua Appia have been discovered, one by Raffaelo Fabretti in 1667 just inside the Porta San Paolo gate, one by English archaeologist John Henry Parker in the San Saba tufa quarries near the Aventine in 1867, and by Rodolfo Lanciani under the remains of an ancient villa on the Via di Porta San Paolo in 1888. These sections were small and in poor condition, cut tunnels that were later lined with stones. The newly discovered section is distinct both because it is in exceptionally good condition and because it is a constructed dry stone wall an extraordinary 32 meters (105 feet) long. It is two meters (6.5 feet) high and is made of five rows of large tufa blocks arranged in prism shape. The water was carried from east to west by a lead pipe known as a fistula aquaria. 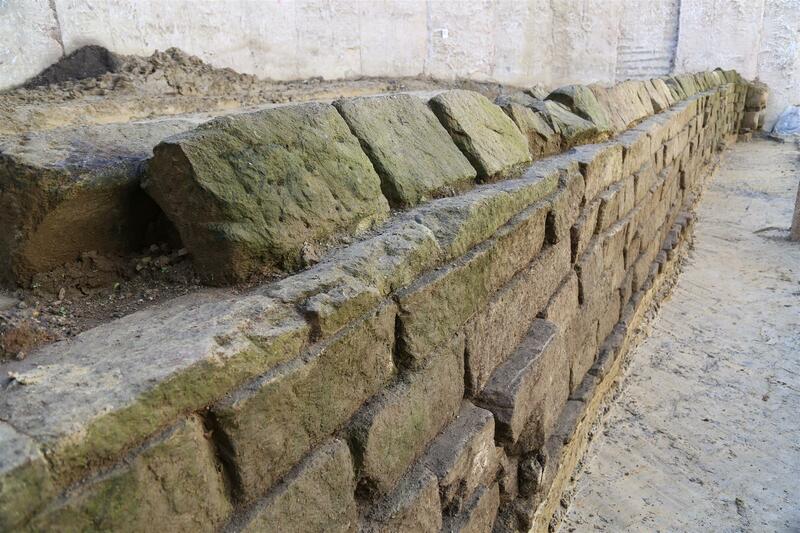 Because the structure is buried so deep, it wouldn’t be possible to put the aqueduct on display in situ. Archaeologists are therefore dismantling the whole thing in order to rebuild in a new location as yet to be determined. 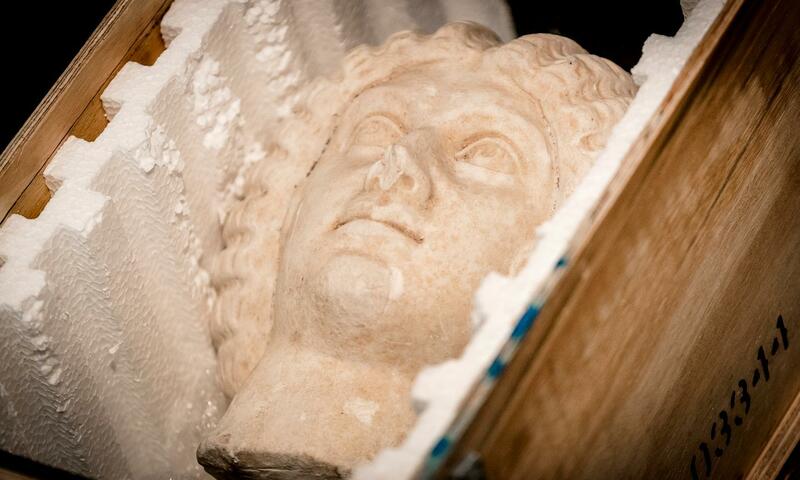 The head of a statue of Roman Empress Julia Domna that almost wound up on the auction block in Amsterdam has been returned to Italy after the Carabinieri Art Squad determined it had been recently stolen. In May of 2015, a man and a woman attempted to sell statue head through Christie’s Amstersdam office. The appraisers and experts were immediately suspicious, as they well should have been, and Christie’s lawyer called the Art Squad. The piece, one foot high and dating to the 2nd century A.D., wasn’t on the Art Squad’s list of stolen and looted artworks, but their experts were able to trace its origins to Hadrian’s Villa in Tivoli, the imperial country retreat/enormous palace built by the Emperor Hadrian in second and third decades of the 2nd century. A number of Severan dynasty portrait busts were unearthed at the villa during excavations in the 1950s, evidence that it was used by the imperial family well into the 3rd century. It was last on display in 2012 at an exhibition held in the Museum of the Canopus. Someone apparently stole the head after that, possibly from storage. The auction house cooperated with the investigation, suspending the sale so the Art Squad and the Dutch police could work together to research the head. 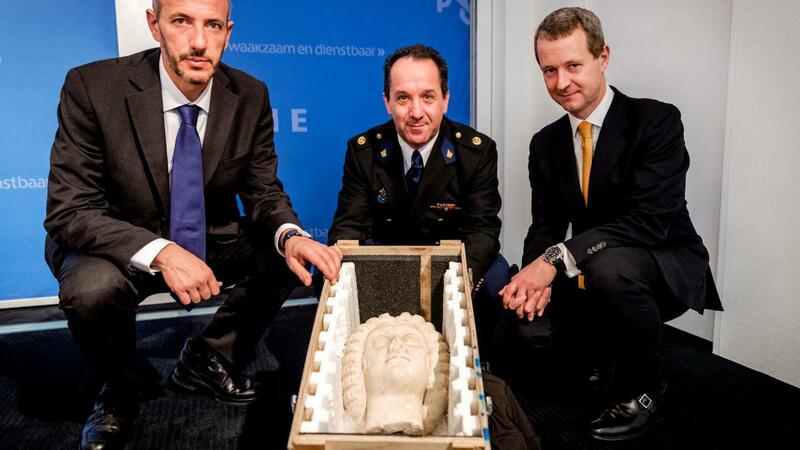 In addition to confirming the true origin of the object, the joint investigation identified two Dutch citizens who were illegally in possession of the statue head. Armed with all the evidence, the police confiscated the portrait and returned it to representatives of the Carabinieri Art Squad. 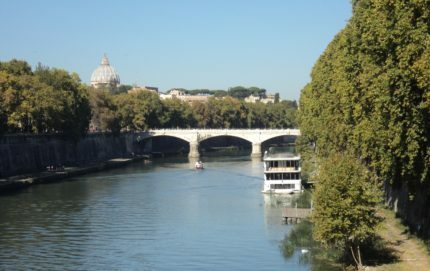 It will be kept with authorities in Rome while the legal case proceeds. When it’s all over, Julia Domna will go back to Hadrian’s Villa with all her family members. 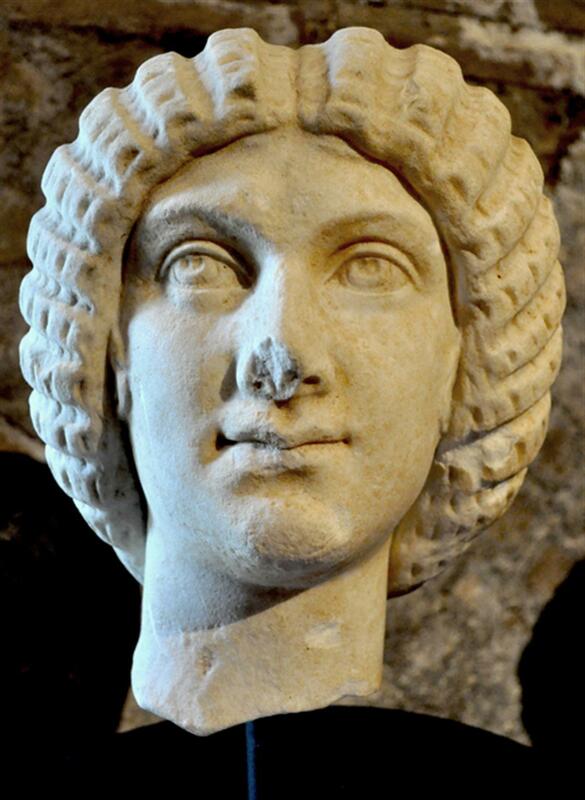 Born in what is today Homs, Syria, to a wealthy family of senatorial rank, Julia Domna was the second wife of Septimius Severus (r. 193-211 A.D.). He chose her because she had been prophesied to marry a king, and Severus was a rising political and military star with ambitions for the imperial throne. They married in around 186 A.D. Their union was by all accounts a happy one. She was intelligent, highly educated, a patron of philosophers and politically astute. Severus relied on her counsel and very unusually for the time, took her with him on military campaigns. This was not advice the young men chose to follow to the letter. Caracalla had his brother killed by members of the Praetorian Guard before the year was out. He did follow his father’s dictum when it came to soldier pay, showering them with bonuses so generous that he soon had to debase the currency. It didn’t buy him security, though. In 217, he was killed by a disgruntled soldier egged on by the Praetorian Guard Prefect Macrinus, that same Macrinus who would just happened to become the next emperor. During Caracalla’s six years of solo rule, his mother did all the grunt work of being emperor. Caracalla was on campaign most of the time, so it was Julia Domna who took on the onerous duties of administering a vast territory where every single legal dispute, no matter how picayune, was adjudicated by the emperor. The amount of paperwork the imperial administration had to deal with was staggering, hence the staff of thousands of slaves, freedmen, clerks, translators, etc. necessary to keep the wheels turning. Caracalla showed a mark disinterest in this aspect of the job, while his mother proved willing and able. After she heard of his assassination, Julia Domna committed suicide. Her distinctive style, evident in her portraiture, and her great power and influence during the reings of her husband and son, make her busts among the most recognizable. The one, the only forensic hairdresser Janet Stephens covers Julia Domna’s styling in videos on her YouTube Channel. 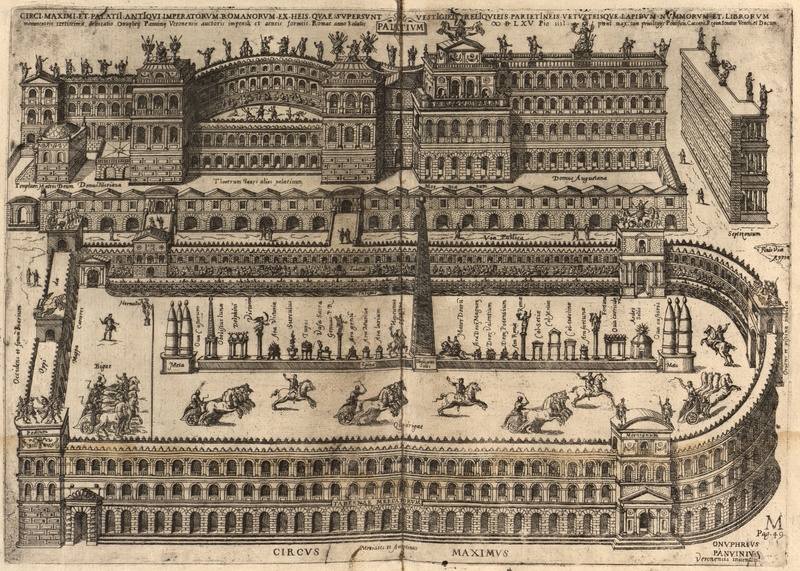 According to Livy’s account of early Roman history in Ab Urbe Condita, the first iteration of the Circus Maximus was built in the valley between the Palatine and Aventine hills by Lucius Tarquinius Priscus, the legendary fifth king of Rome, in the 6th century B.C. 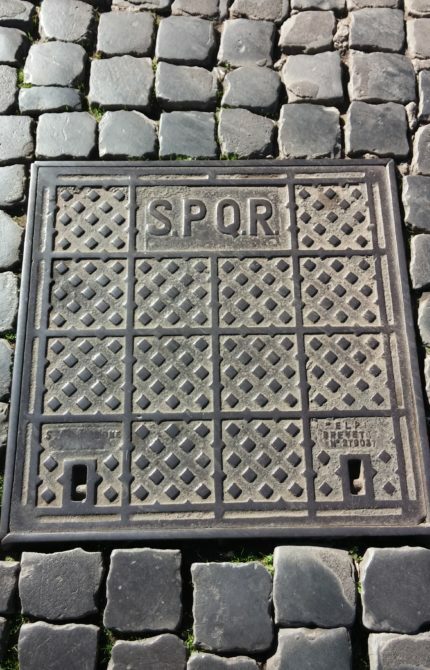 There’s no archaeological evidence for this (or for much of an anything else to do with the putative kings of Rome, for that matter). The low-lying area would have been subject to regular flooding and was probably farmland. A drainage system would have made it possible for the field to be used for horse races, but the wooden stands were temporary and rebuilt many times. 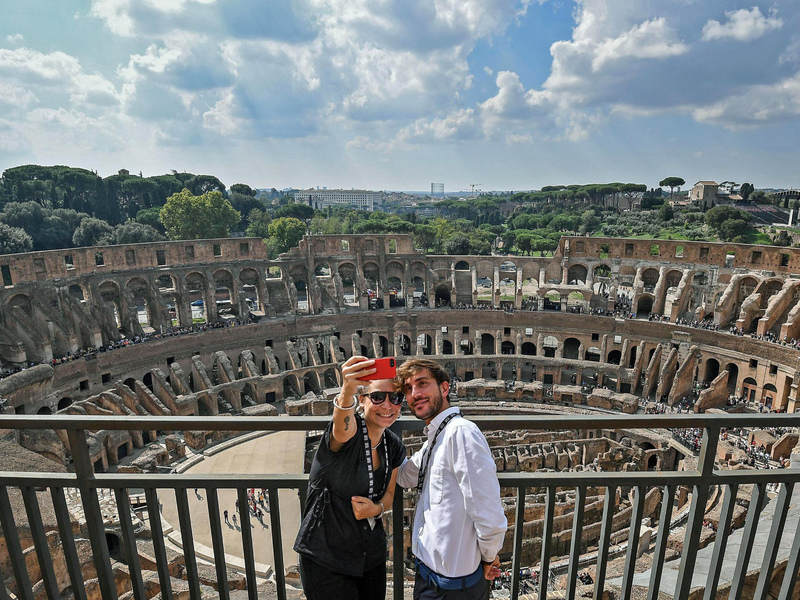 Permanent wooden seating was built in 329 B.C. ; the first stone seating (for senators, of course) was built in the 190s B.C. It was Julius Caesar’s ambitious building program that developed the Circus Maximus into something more akin to our image of it. He built stands on both sides down the full length of the track, with the trackside seating reserved for senators. Equites (knights) got the next rows and the plebs got the nosebleed seats. There were shops under the galleries where sports fans could get a bite or place a bet. 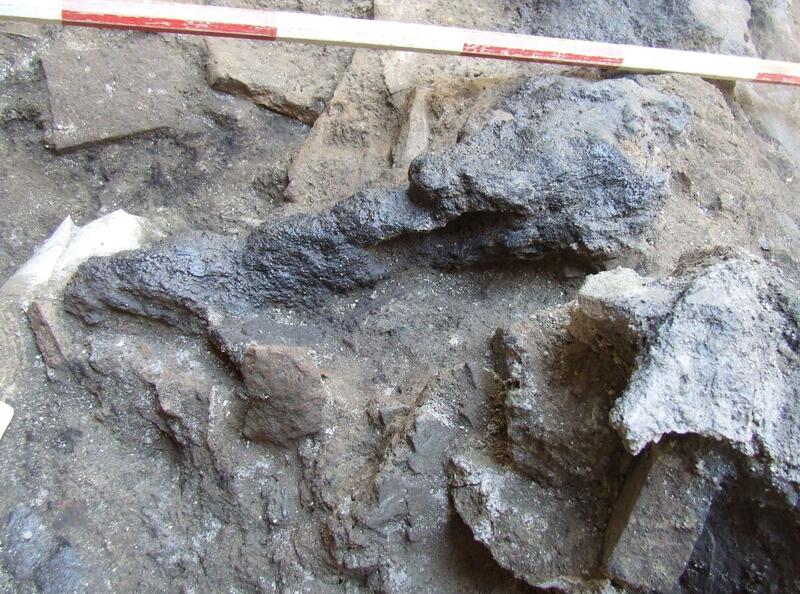 It was all still wood, though, and was seriously damaged by fire in 31 B.C. and the great conflagration of 64 A.D. during which Nero so notoriously strummed the lyre. 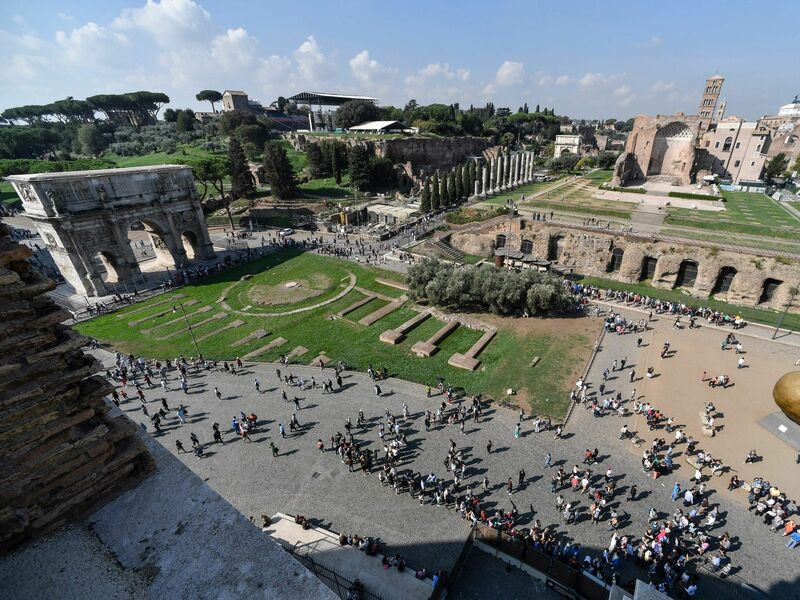 The stone Circus Maximus as we know it now was built by Trajan in the first years of the 2nd century and commemorated on a bronze sestertius minted from 103 to 111 A.D. At its largest, it was 600 yards long and 140 yards wide and could seat a quarter of a million people. 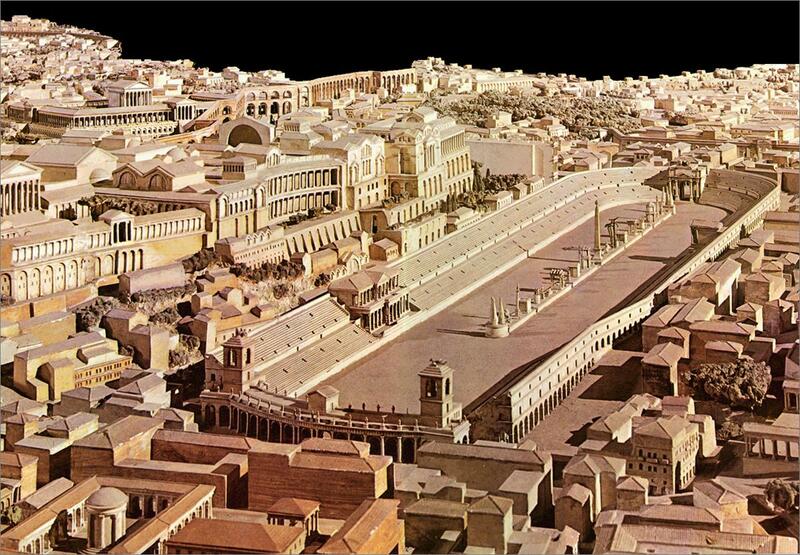 When I lived in Rome in the 80s, the Circus Maximus was open, but there wasn’t much to see. You could picnic on the grassy slopes which once held stone and wood bleachers, go jogging, walk your dog. At night it was something of a shady place frequented by the demimonde, as it were. More recently it’s been a venue for concerts and other public events. It was basically a large oval field with some bits in the middle and at the ends. In 2009, the city initiated a program of excavation and restoration to create an archaeological park worthy of such a great icon of the Eternal City. 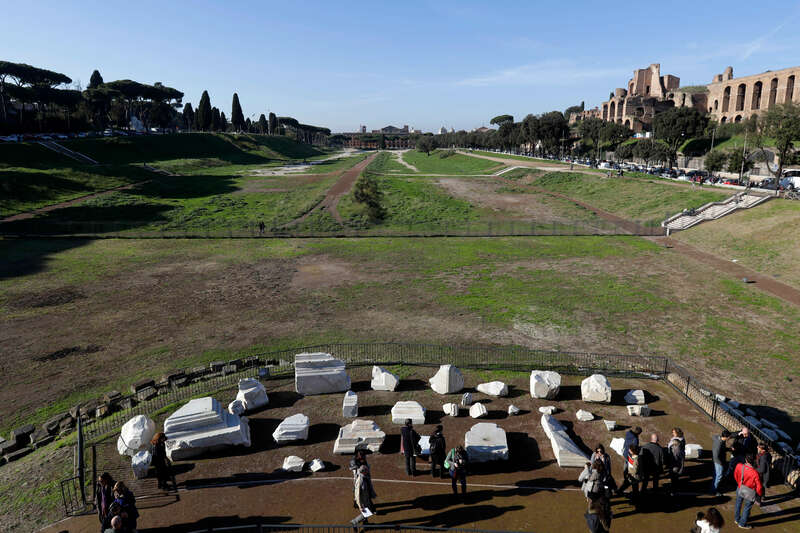 While excavations will continue, the newly revived Circus Maximus is now open to visitors. 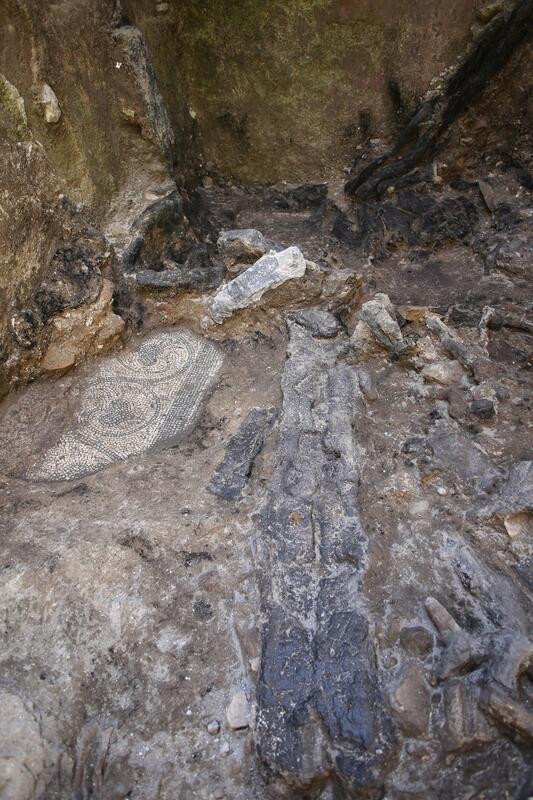 The excavation has uncovered many artifacts and structures long obscured by the overgrowth. Archaeologists have found more than 1,000 bronze coins, fragments of gold jewelry, and perhaps most excitingly, the bottom of a glass goblet with the image and name of a horse engraved in gold. Named after the legendary king of Alba Longa, descendant of Aeneas of Troy and grandfather of Romulus and Remus, Numitor the horse holds a golden palm branch in his mouth, attribute of the goddess Victory. This is the first time any kind of horse-related artifact has been found at the stadium which held chariot races for 1,000 years. 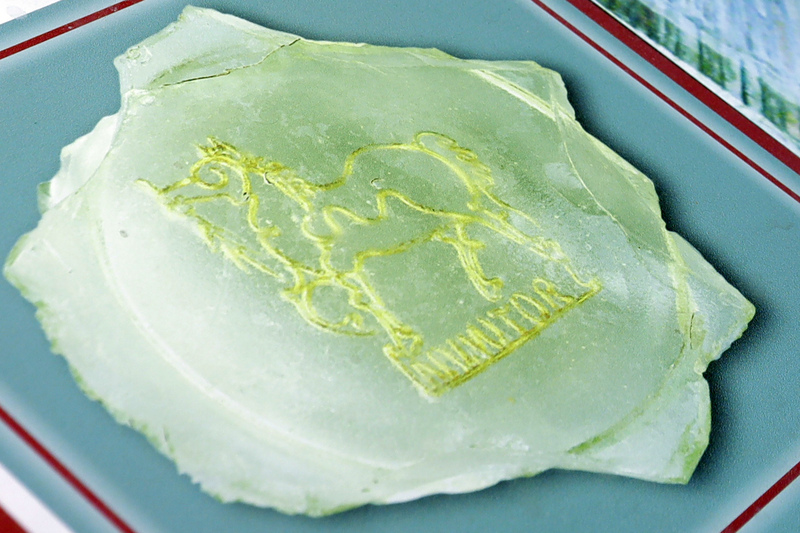 The image of Numitor the lucky horse will be the new logo of the Circus Maximus. 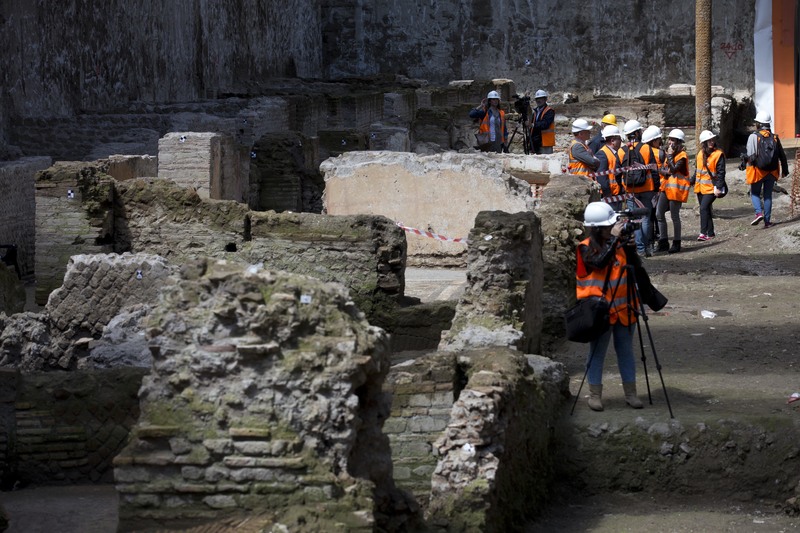 A wealth of architectural remains have been revealed on the Palatine end of the track. Visitors will now be able to walk two stories of galleries: the lower one that senators walked to reach their trackside seats and the upper one the plebs used to reach their bleachers. 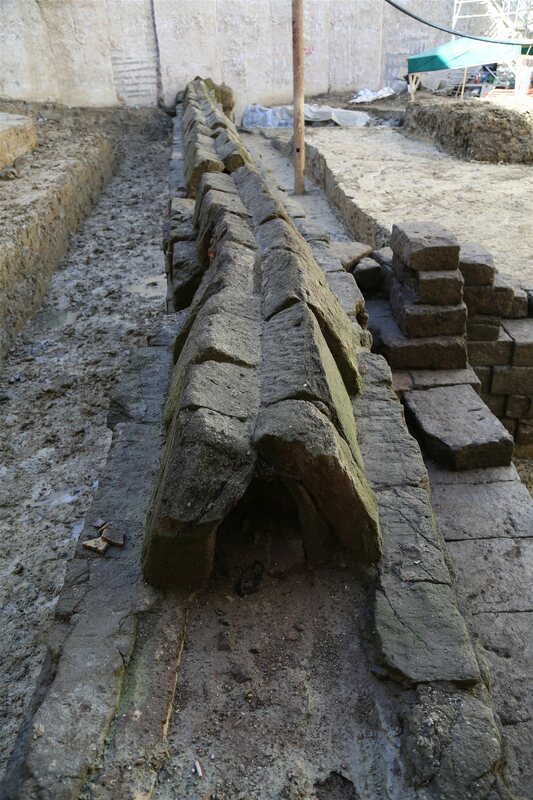 From there, they can walk along the paved road unearthed during the recent excavations which features a large water trough made of travertine slabs. They can see the latrines used by the same ancient audience members, and the shop fronts, brothels, money changers and betting parlors underneath the galleries. 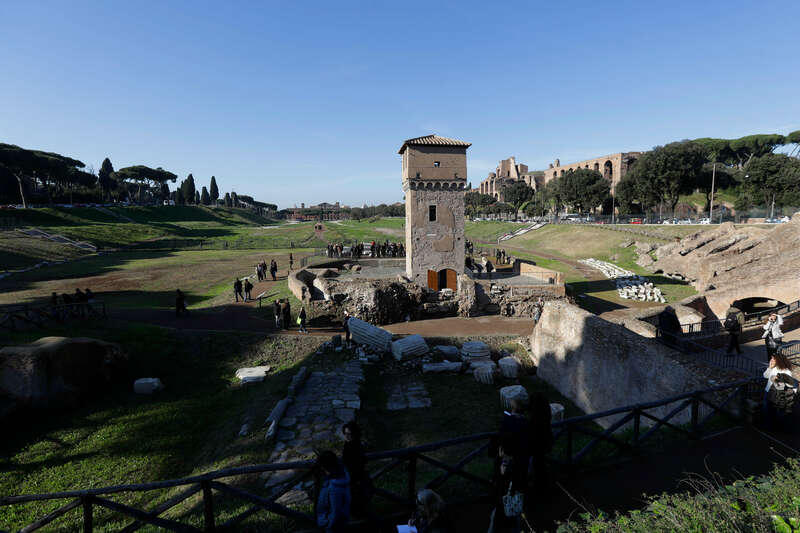 The Torre della Moletta, the 12th century tower built by the powerful Frangipani family as part of a fortification system that extended up the Palatine, has been restored and a new staircase added to the interior so visitors can climb to the top of the tower and enjoy a spectacular view of the Circus Maximus. In the hemicycle behind the tower, large marble fragments of the ancient structure discovered during the excavations have been tidily arranged in the grassy space: steps, cornices, column capitals, thresholds of shops, marble columns and the architectural elements of the triumphal arch of Titus discovered last year. Some of the bronze letters of the inscription dedicating the arch to Titus’ conquest of Judea — previously known only from a 9th century transcription — were found during the excavation, a wonderful surprise given how much ancient bronze was melted down in the Middle Ages. 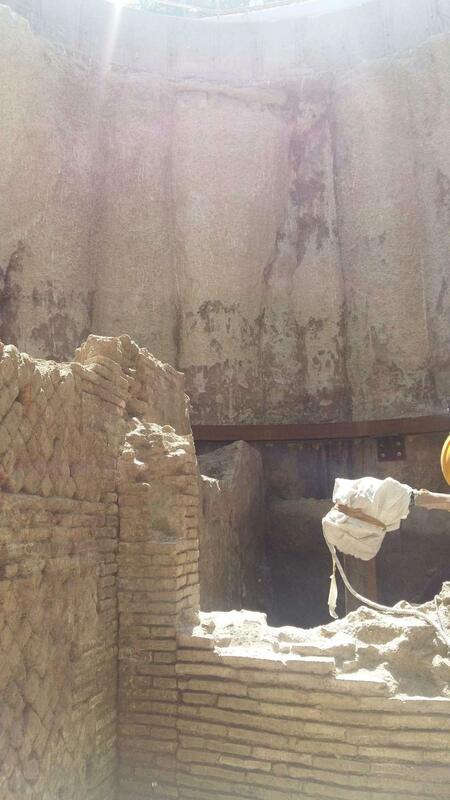 Archaeologists plan to continue excavations. They are hopeful that something of the ancient spina, the central strip that in its heyday boasted two Egyptian obelisks, an altar to the gods and the lap counters (first egg-shaped, later dolphins) so memorably portrayed on the screen in Ben Hur, might still slumber under the earth. Maybe the remnants of the original track or drainage system are down there 30 feet underground. Any discovery at all from the archaic era would be a massive archaeological bonanza. 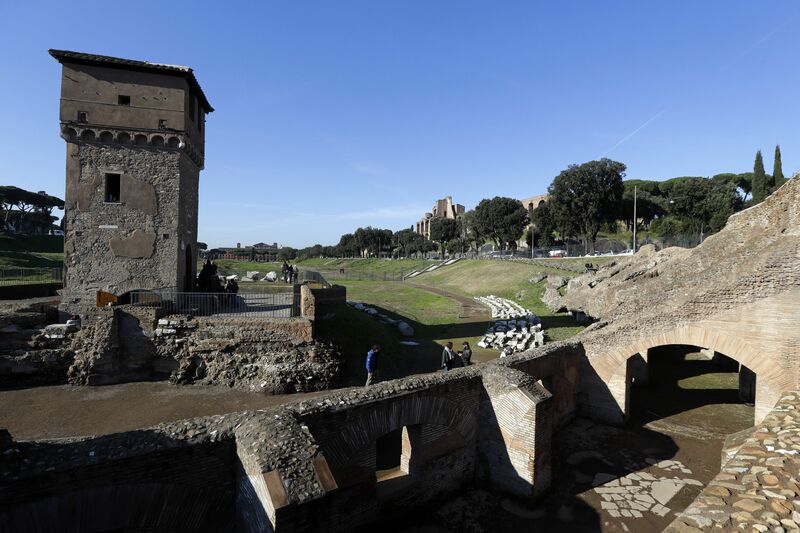 The Circus Maximus will be open to tourists (tickets cost three to five euros) every day from now through December 11th. After that it will be open on weekends only, weekdays by appointment. 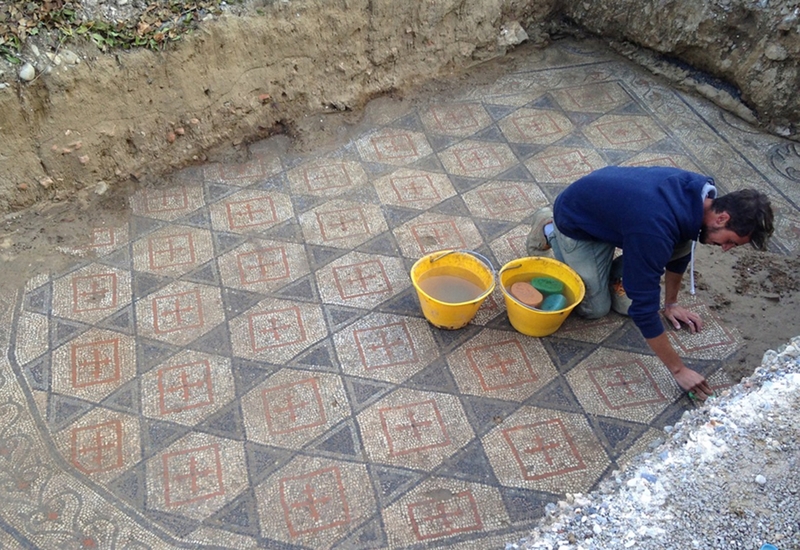 Archaeologists have discovered the ruins of a grand Roman villa outside of Florence. 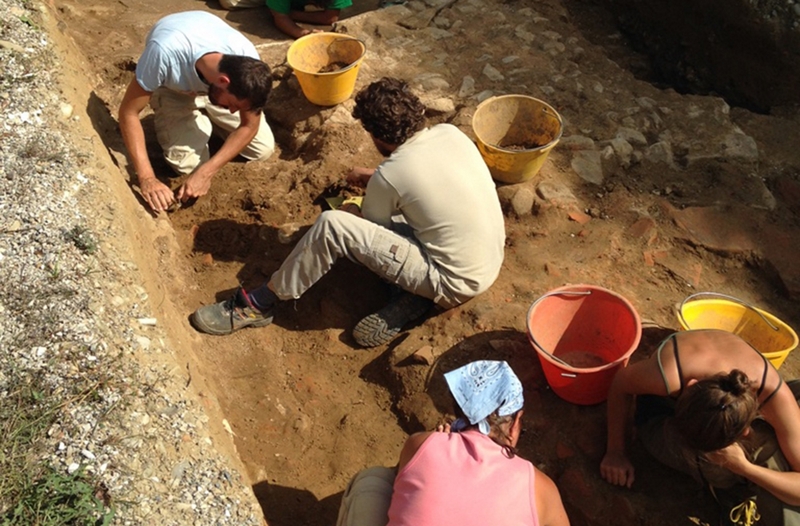 The luxury home was unearthed on private property in what is now the village of Capraia by archaeologists and students from the University of Pisa. So far the team has found a hexagonal structure with six rooms which they believe to include a dining room suite with multiple triclinia. It is of monumental scale, 100 feet in diameter with ceilings estimated to be 50 feet high. 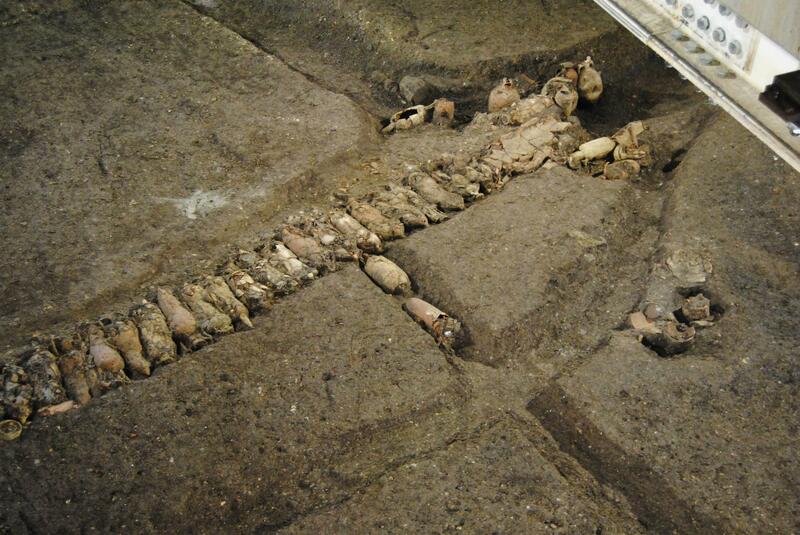 Multiple polychrome mosaic floors survive, including a scene of a wild boar hunt in the main reception area. 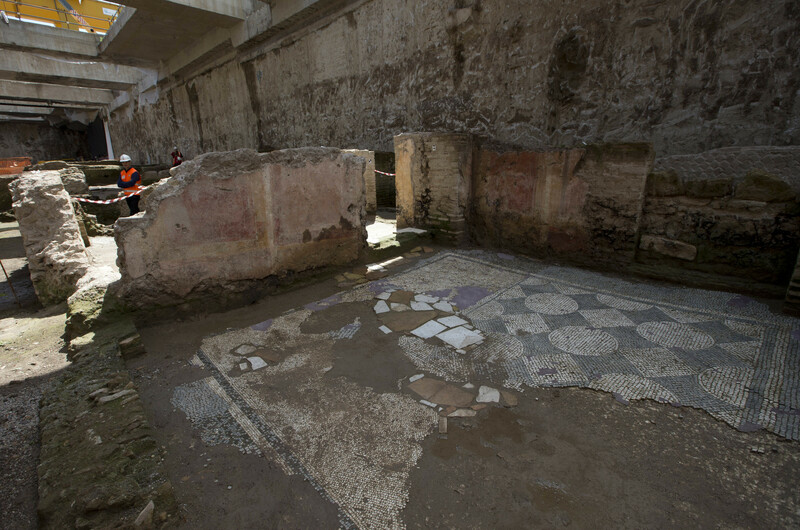 They have also found the remains of the hypocaust system that heated the villa’s baths, namely the hollow space under the floor with pillars of tile (pilae stacks) that supported the floor of the hot room. 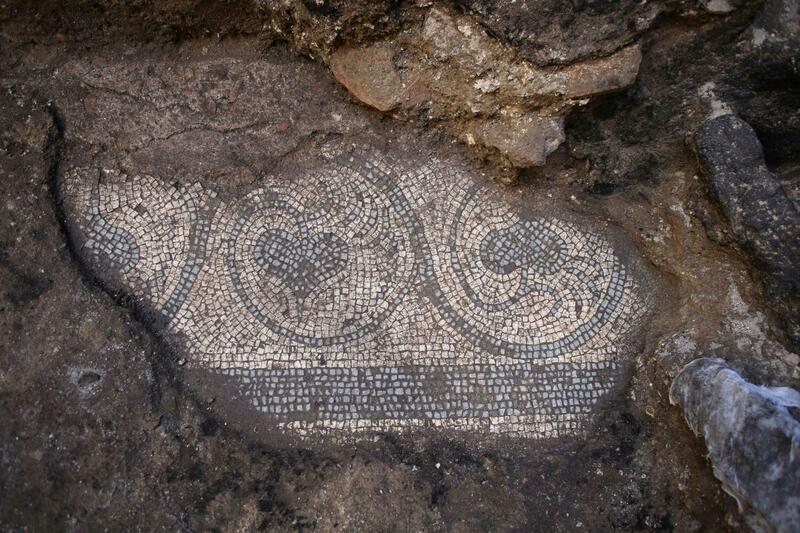 The villa dates to the 4th century A.D. and is an exceptional example of a late antiquity country estate. The size and complexity of the villa is so impressive that dig leader Professor Federico Cantini believes the only comparable aristocratic villas from that period are found in Constantinople, then still just a few decades into its tenure as the new capital of the Roman Empire. The mansion was enlarged in the 5th century only to be plundered and abandoned in the 6th. 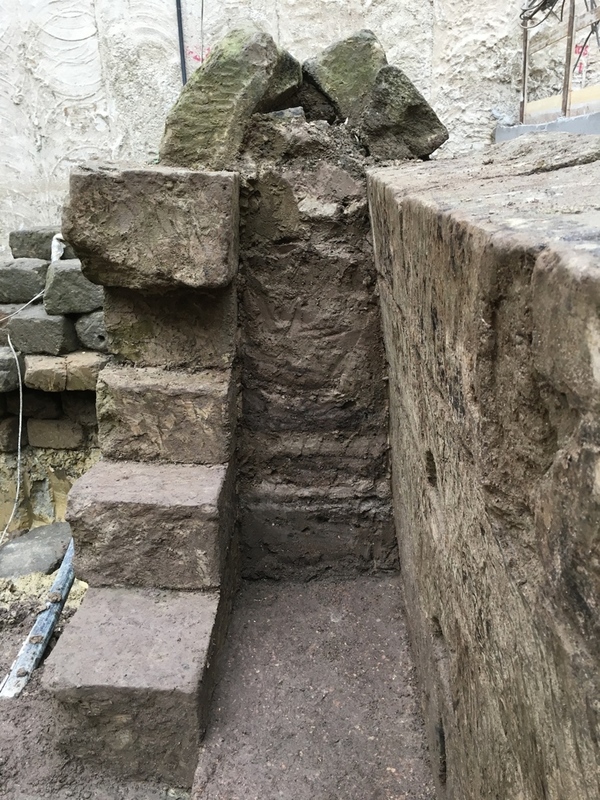 There is also some evidence of occupation in the late Middle Ages, probably by people who were stripping what was left of it for building materials. 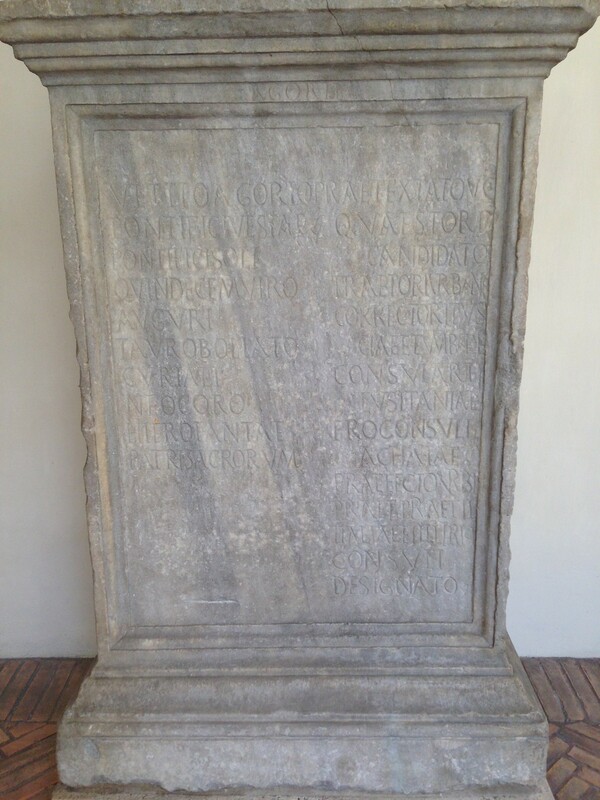 An inscription on a stone slab found at the villa identifies the owner as Vettius Agorius Praetextatus, a well-known and highly esteemed 4th century senator who had a distinguished political career and who was at the epicenter of the last significant attempt by the few remaining non-Christian members of the aristocratic ruling class to preserve traditional Roman religions in the face of the onslaught of legislation and Christianization practices that would destroy them. Praetextatus held high political and religious office. He was governor of Tuscany and Umbria, consular of Lusitania, proconsul of Achaia, urban praetor, praetorian prefect to Emperor Valentinian II and consul-elect (he died before he could take office). His many religious titles and priesthoods included augur, quindecimvir (guardian of the Sibylline Books), pontifex Vestae, pontifex Solis, sacratus Libero et Eleusinis and curialis Herculis. He and his close friend and senatorial colleague Quintus Aurelius Symmachus, who was a very wealthy scion of the patrician Aurelian family and who was known to have at least a dozen country villas of his own, worked together to restore the traditional Roman religions. When he was urban praetor, Praetextatus petitioned the emperor for the restoration of sacred objects looted from temples. When he got the go-ahead, he assigned the job of collecting whatever was left to Symmachus. In 384 A.D., Symmachus wrote an open letter to Valentinian II asking for the return of the Altar of Victory to the Curia, a letter which is still famous today, mainly in conjunction with the equally famous rebuttal written by Ambrose of Milan. Later that year, Praetextatus died. The city plunged into public mourning and there was an outpouring of grief from Romans of all religions. His wife of 40 years, Aconia Fabia Paulina, had her eulogy for him, apparently a version of her funeral oration, inscribed on his funerary monument. She shared his religious convictions and held many religious honors herself, and in the oration she said he was now in the heavens where, gods willing, she would soon join him. And she did. We know that Praetextatus and Paulina had two houses in Rome, one on the Esquiline whose vast gardens reached what is now Termini railway station and one on the Aventine. Now we know they had a huge country palace in Tuscany. The excavation will be open to the public this weekend, on Saturday afternoon from 3:30 to 6:30 PM, and Sunday from 9:30 AM to 6:30 PM. Professor Cantini and the University of Pisa team will be present to explain the site to visitors. 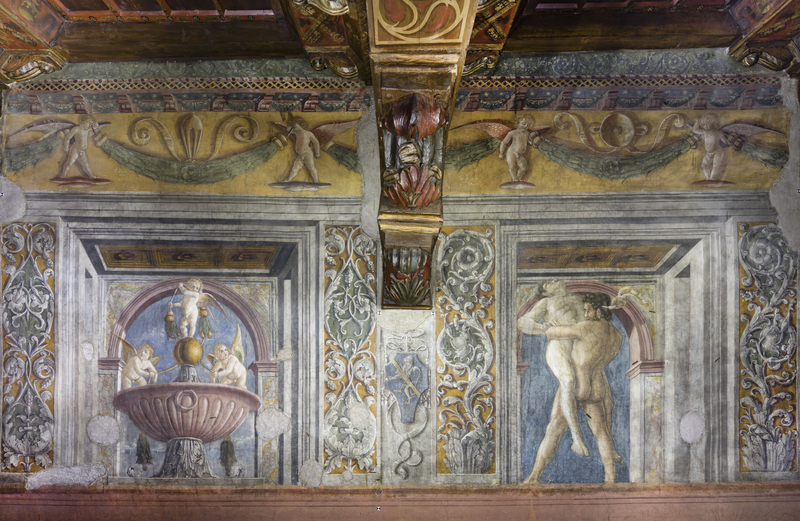 Thanks to a generous grant from the Silvano Toti Foundation, the Hercules Room of Rome’s Palazzo Venezia is now getting a much-needed restoration. The Palazzo Venezia was built in the middle of the 15th century at the behest of Cardinal Pietro Barbo, the future Pope Paul II. 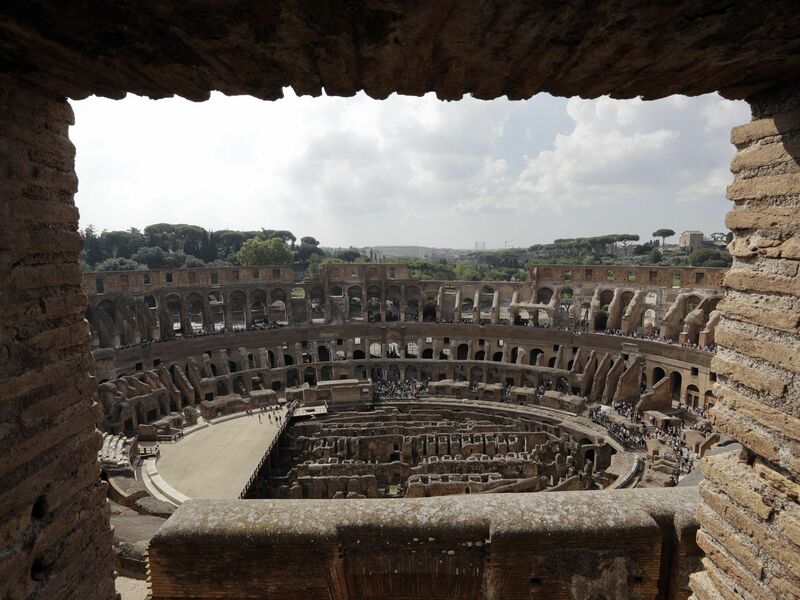 The stones used to build it were taken from the Colosseum, just a short jaunt to the southeast. One of the first buildings in Rome with Renaissance architectural elements, the Palazzo Venezia would outlive many later Renaissance buildings which were damaged or destroyed by the troops of the Holy Roman Emperor during the Sack of Rome in 1527. In 1564 the Pope granted use of the palace to the Most Serene Republic of Venice for its embassy. From the end of the 18th century until World War I, it was the seat for the Austrian ambassador to the Holy See. At war with Austria-Hungary, the Italian state claimed it in 1916. Benito Mussolini claimed the Map Room in the Palazzo Venezia for his office and many a newsreel captures him speechifying from the balcony to adoring crowds below. He even built a secret bunker in the basement. Today the palace is a national museum, home to thousands of works of art. While the building was modified repeatedly over five centuries, it still holds many original decorations from the 15th century. 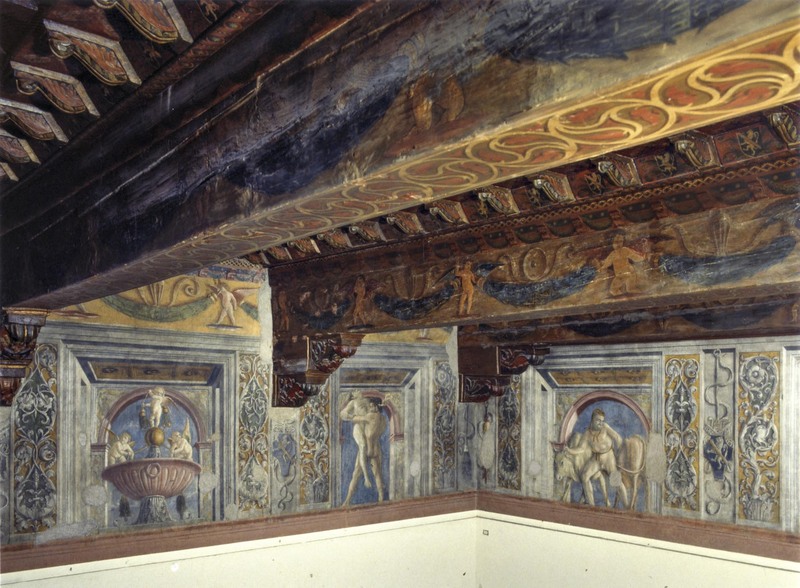 The Hercules Room is perhaps the most sterling example, with its frescoes depicting the Labours of Hercules and elaborately carved and painted wooden ceiling. 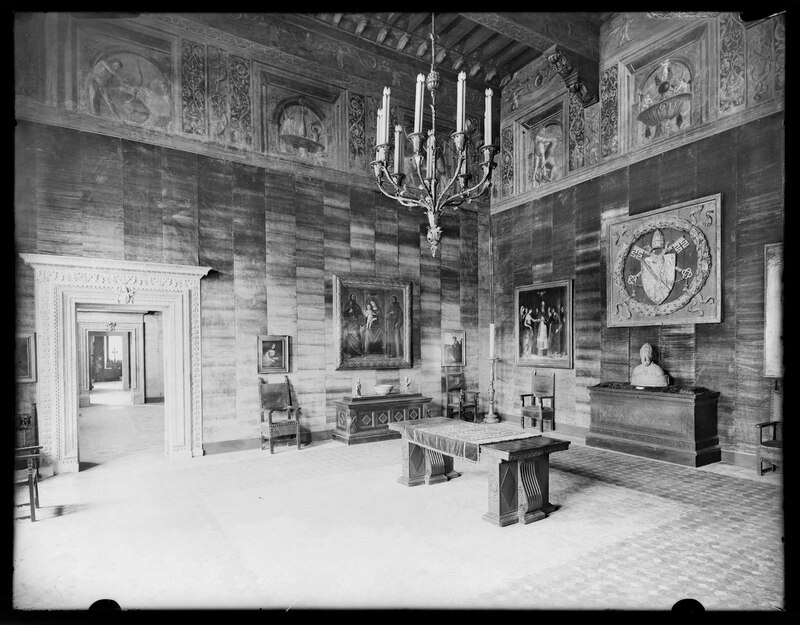 Located on the piano nobile (the first floor where the receiving and private rooms of the noble family were), the Hercules Room was at one end of the Pietro Barbo’s apartment. Once he was elevated to the Throne of Saint Peter and got new digs in the Vatican, the room was used to store pontifical vestments. The highest part of the walls are decorated with eight panels displaying scenes from the Labours — Hercules and the Nemean lion, Hercules and Antaeus, Hercules with one of Geryon’s head of cattle, Hercules and Geryon, Hercules slaying the dragon Ladon, guardian of the Apples of the Hesperides, Hercules and the Ceryneian Hind, Hercules and the Stymphalian Birds, and lastly, Hercules and the centaur Nessus. 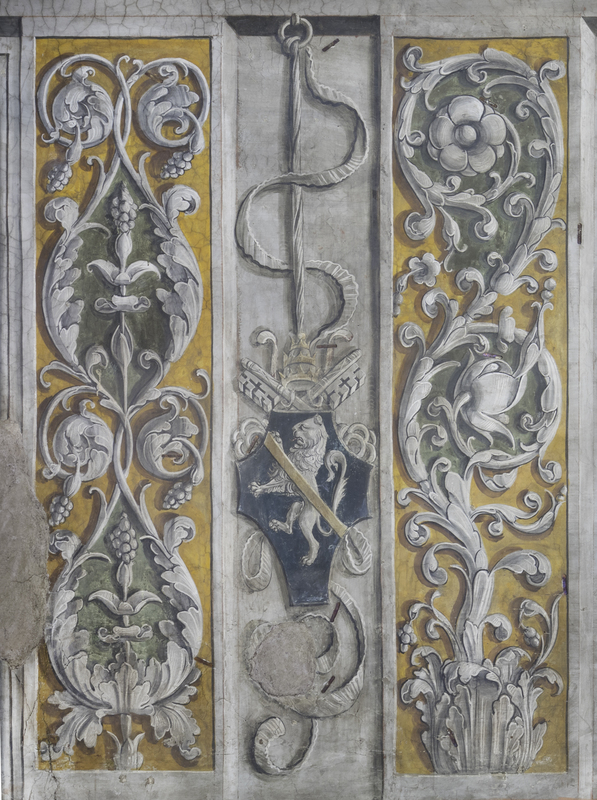 Frescoed between the Labour panels are little putti, garlands, architectural motifs and the coat of arms of Pope Paul II. 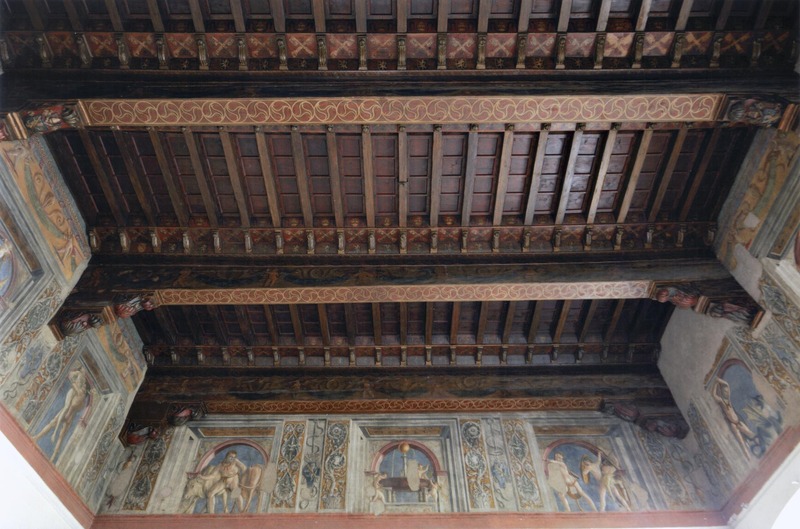 Some past scholars have attributed to the great master of perspective and antique motifs Andrea Mantegna who famously frescoed the exquisite Camera degli Sposi in the Ducal Palace of Mantua. Others attributed them to an unnamed artist at the pontifical court. The artist remains unknown today, although scholars believe he was probably from northern Italy. 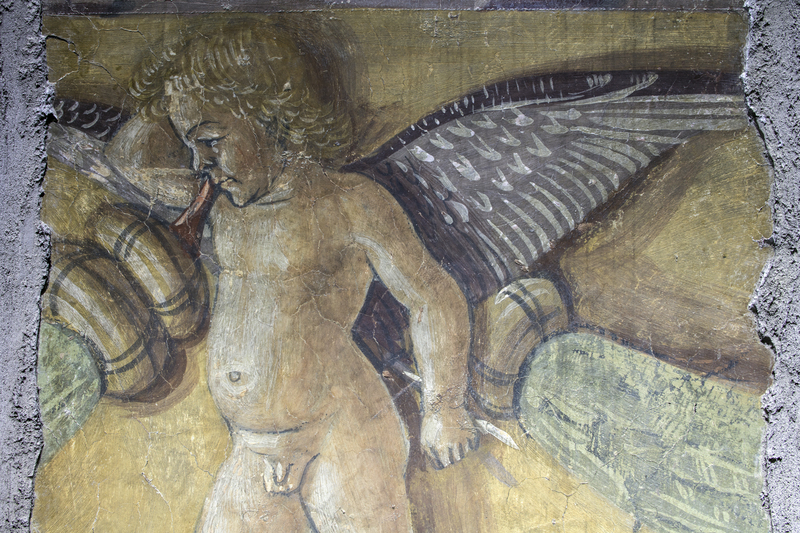 The restoration and study of the frescoes will give experts the opportunity to revisit the authorship question. The restoration is expected to take four months, from July to October. They will be a busy four months. 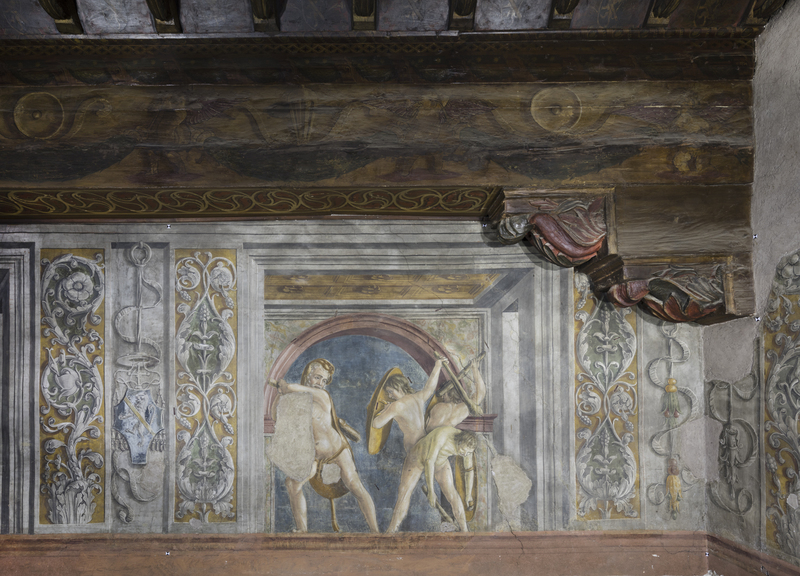 On the agenda are the cleaning of the frescoes, the strengthening of the plaster layer and paint layers, revising past restorations and disinfecting and disinfesting the wood ceiling. 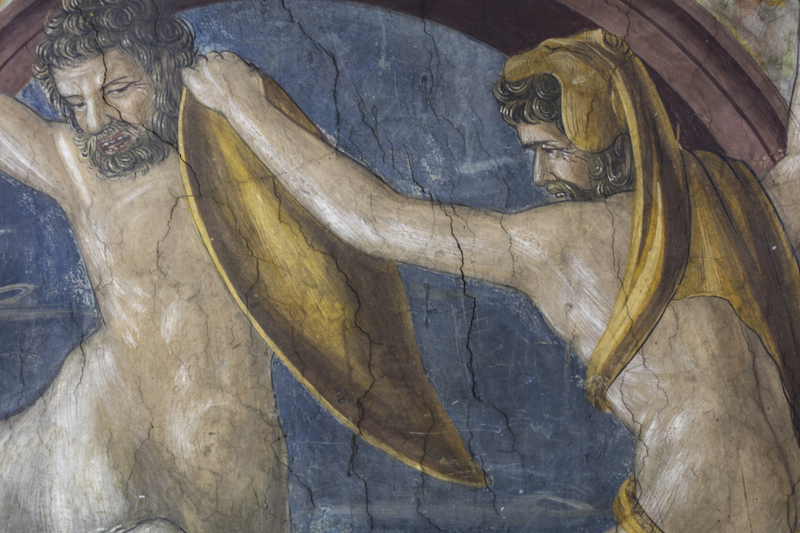 Restorers will also investigate the techniques used in the original painting of the frescoes. 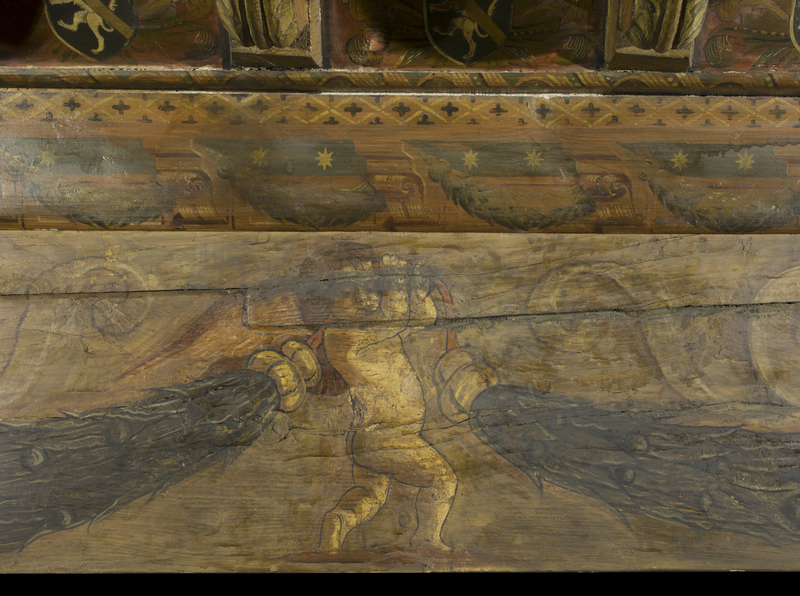 The restorers also said dried pigments used in previous restoration works hid the artworks’ original colors. “By cleaning them, we hope to rediscover the polish of the paintings, which were supposed to look like large windows that were open towards the outside”. Free guided tours of the room will be offered to the public starting in September so visitors will have the chance to view the restorers at work. 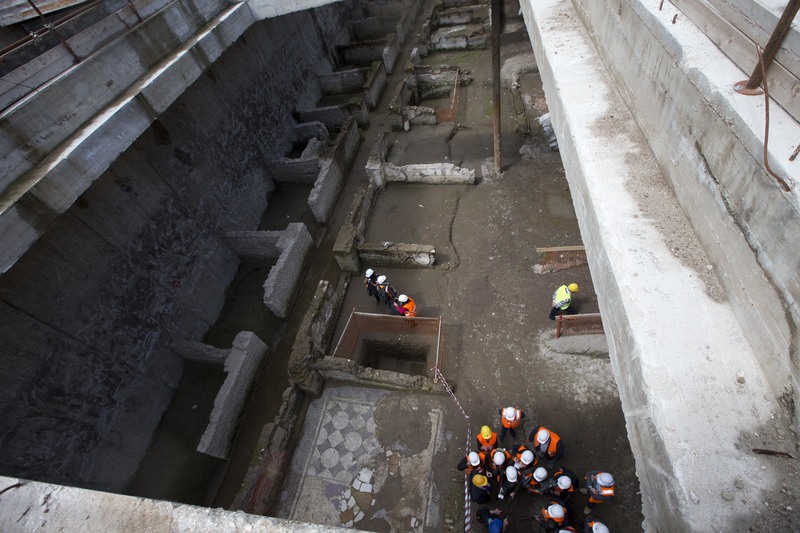 Construction of Rome’s third subway line, Metro Line C, has made a sensational discovery: the remains of a 2nd century Praetorian Guard barracks. Thirty feet under Via Ipponio between the Baths of Caracalla and the Basilica of St. John in Lateran in the historic center of Rome, the barracks cover an astonishing 1,753 square meters (18,870 square feet) of surface area (ed note: the AP story says it’s 900 sq meters, but all of the Italian press reports the larger figure so I’m going with their data), and that’s just what’s been exposed thus far. 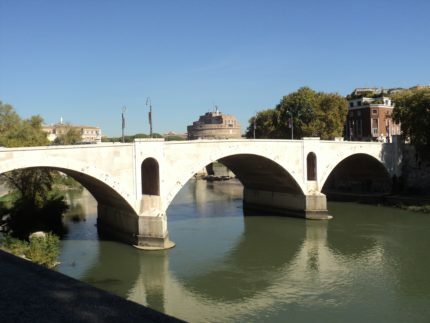 They were built during the reign of the Emperor Hadrian (117-138 A.D.), only to be demolished just over a century later during construction of the Aurelian Walls (271-275 A.D.). The demolition was thankfully half-assed, leaving impressive ruins — the walls are up to five feet high — which were then buried. There are 39 rooms, each four by four meters (13 x 13 feet), that open onto a central hallway. 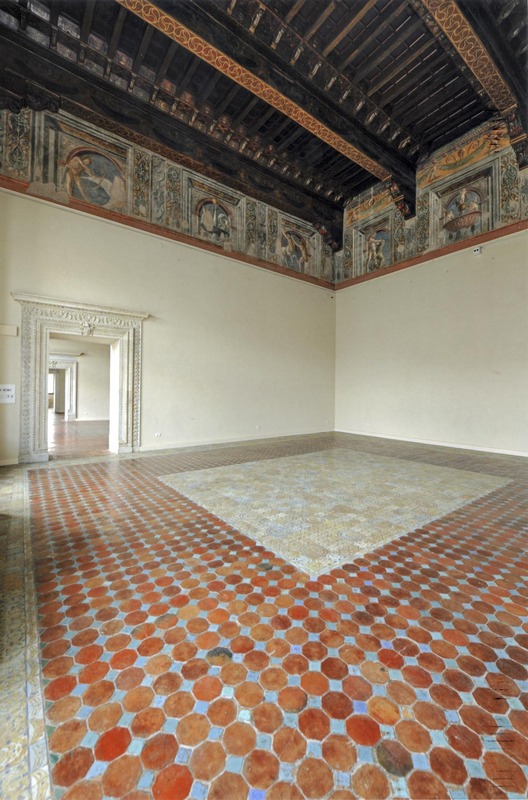 Some of the rooms, likely the officers’ quarters, are richly decorated with mosaic floors and frescoed walls. The bricks in the walls bear the stamp of the imperial kilns from 123 and 136 A.D., which is how the structure was dated. There’s also a mass grave on the site. So far 13 skeletons have been excavated from it and a few artifacts including a bronze coin and a bronze bracelet. 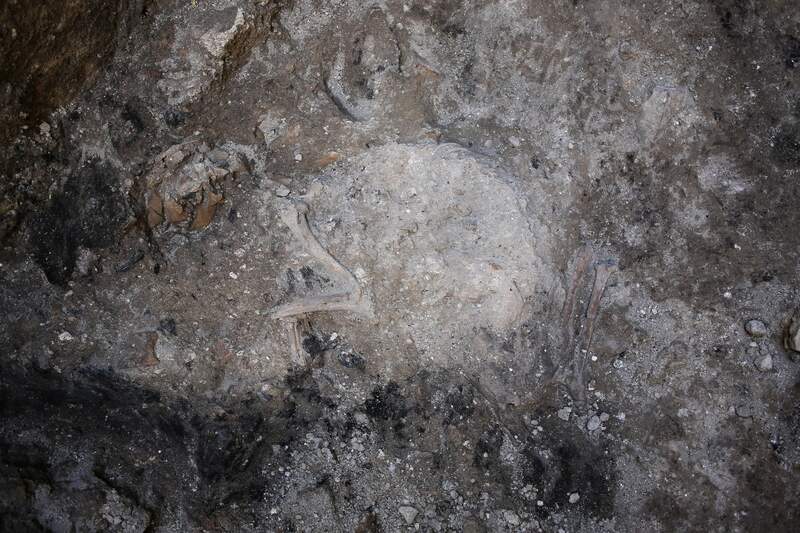 A number of military remains have been discovered in the neighborhood. Under St. John in Lateran is the Castra Nova Equitum Singularium (built under Septimius Severus, ca. 200 A.D.), a couple of blocks northeast under Via Tasso is the Castra Priora Equitum Singularium (Trajan, ca. 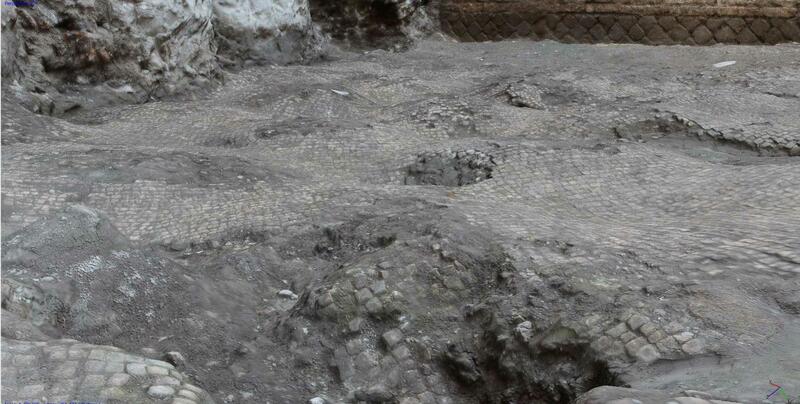 100 A.D.), and west of that near the church of Santo Stefano Rotondo is the Castra Peregrina (Augustus, 1st century A.D.). 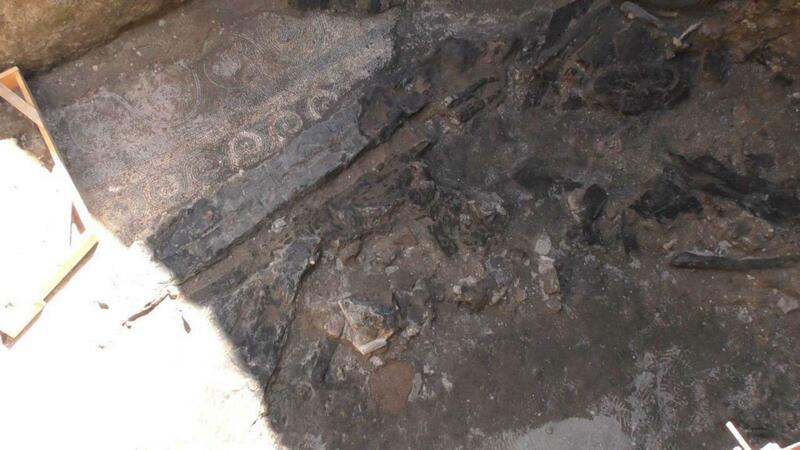 Work on Metro Line C began in 2007 and has been beset by funding problems, corruption scandals and wonderful but expensive and time-consuming archaeological discoveries. While the subway tunnels themselves have been dug 80 feet below the surface to avoid hitting constant ancient roadblocks, the new stations can’t avoid bumping into thousand of years of history. The barracks site was discovered during construction of the Amba Aradam station and the city authorities tried to keep the news under wraps to avoid having to announce work on the line was suspended yet again. 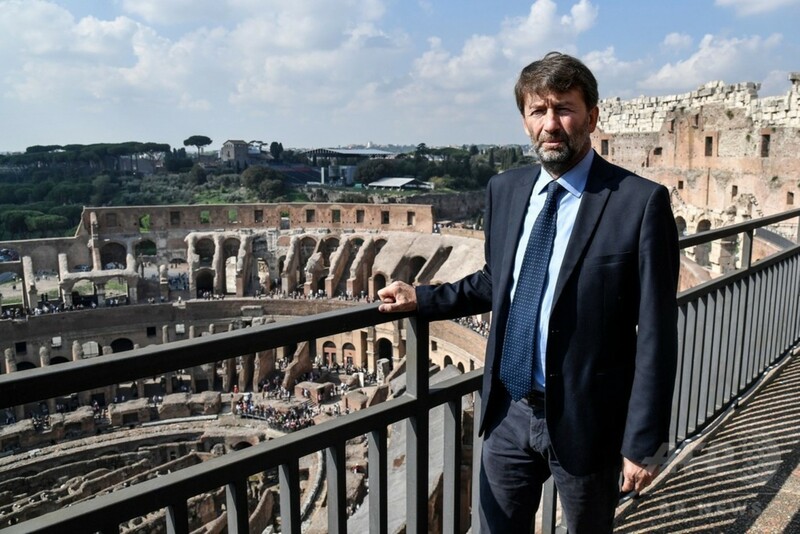 The newspaper Il Tempo broke the news of the find last Wednesday, publishing a story complete with quotations from a letter about the find written by Francesco Prosperetti, Special Superintendent for the Archaeological Area of Rome. In the letter Prosperetti describes the discovery as exceptional and in such a good state of conservation that it would not be possible to pursue the idea of dismantling it, finishing construction and then rebuilding the structure in its original context. The barracks complex is so large it occupies the entire southern half of the station and extends beyond it. The northern half of the station is also replete with archaeological remains that haven’t been explored so it’s not known at the moment what they are or the impact they’ll have. As for how so large and complete an ancient structure could have been missed by preventative archaeology done on the site before construction began, Prosperetti notes that archaeologists took core samples which pointed to ancient boundaries under a massive modern structure, but they were buried so deep underground it wasn’t possible to explore them in the preliminary stages. The subway company now has to figure out how to proceed, and however they go about this, it’s likely going to cost time and money. Metro Line C is already the most expensive subway construction project in history. In a press conference Monday, Prosperetti gave assurances that both the great archaeological importance of the find and the Metro budget and deadlines would be respected. 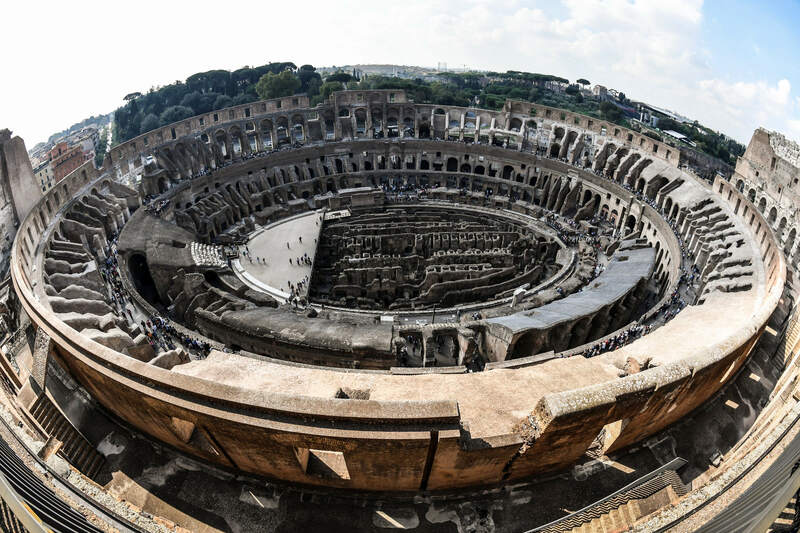 The plan is to integrate the ruins into the station, creating the first fully fledged “archaeological station” in Rome, all without extra expense or delays. If that sounds less than entirely believable to you, that’s because it is.